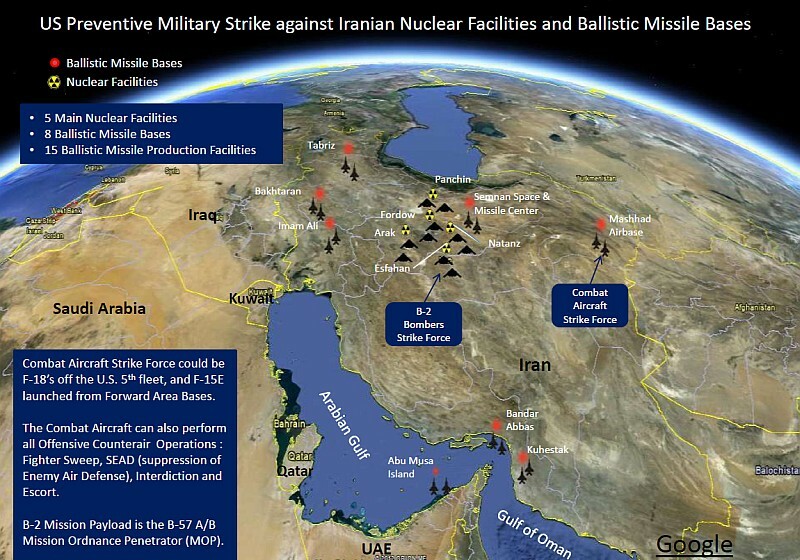 U.S. Central Command and Pentagon war planners have concluded that there are at least three possible Israeli attack options against Iran's nuclear facilities. Israel may need the United States to join militarily, but the U.S. military currently has no interest in a preventive strike. A massed Israeli Air Force bombing campaign targets key Iranian nuclear sites. Such an assault would be coupled with strikes from submarine-launched cruise missiles and Israeli-based medium-range Jericho II and long-range Jericho III missiles, according to a highly placed U.S. military officer. The attack may include a coordinated cyber and electronic warfare attack. But the Joint Chiefs of Staff and Centcom planners conclude that such an aerial campaign could not be sustained: "They'll have one shot, one time. That's one time out and one time back. And that's it." Israel has about 25 sophisticated F15I and 100 smaller F16I warplanes, but only the F15Is can carry the bunker-busting GBU-28 guided missile, and even then only one each. 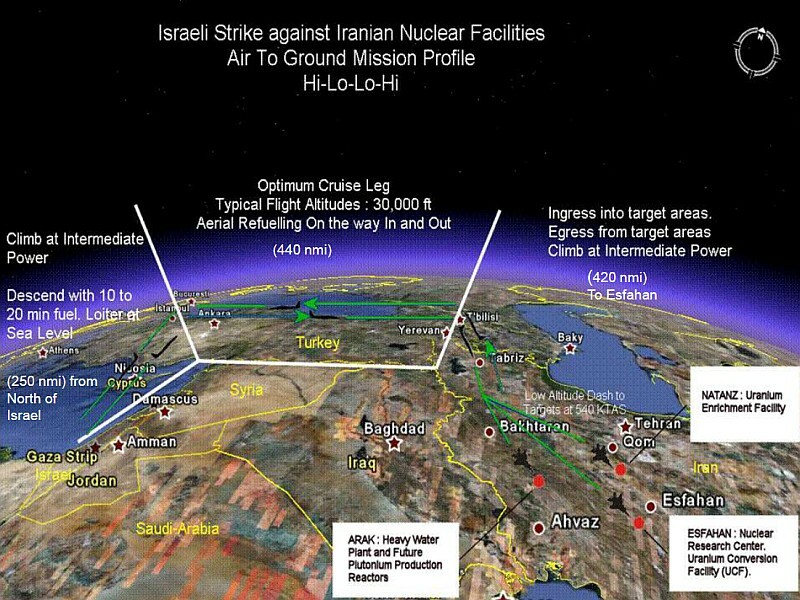 The Israeli Air Force would likely have to carefully pick and choose its targets, settling most probably on four: the heavy-water production plant at Arak, the uranium-enrichment centers at Fordow and Natanz, and the uranium-conversion facility at Isfahan, while leaving out the military site at Parchin and the nuclear reactor at Bushehr, which houses Russian technical experts. The Israeli F16Is would knock down Iran's air defense network, or perhaps drop other, less effective, bunker-busting munitions. Some of these F16Is, but not all of them, would be able to refuel from Israeli KC-707 tankers. Even with that, and even with the best of luck, senior U.S. military officers say that Israel would only set back Iran's nuclear capability by one to two years at best. The U.S. arsenal includes the Massive Ordnance Penetrator, the GBU-57, which can punch through 200 feet of hardened concrete before detonating its 5,300-pound warhead. The United States is rumored to have only about 20 in its inventory. Only a B-2 bomber can carry it. Israelis mount a high-risk but high-payoff commando raid that would land an elite Sayeret Matkal (special forces) unit outside of Iran's enrichment facility at Fordow, near Qom. The soldiers would seize Iran's enriched uranium for transport to Israel. The operation's success would depend on speed, secrecy, simplicity, and the credibility of Israeli intelligence. According to the Pentagon war planner, Israel's access to intelligence on Iranian military and policy planning is unprecedented, as is their willingness to share it with U.S. intelligence officials. The Israeli unit would be transported on a small flight of C-130 aircraft protected by a swarm of F16I fighters. The C-130s would land in the desert near Fordow. The Israeli commandos would then defeat the heavily armed security personnel at the complex, penetrate its barriers and interdict any enemy units nearby, and seize the complex's uranium for transport back to Israel. Prior to its departure, the commando unit would destroy the complex. Benjamin Netanyahu and Defense Minister Ehud Barak are former Sayeret Matkal officers, and recently Israeli Defense Forces head Benny Gantz said the IDF had formed an elite special operations "Deep Corps" to strike far inside hostile territory. The difficulty with the Entebbe-style option is that Israel would be forced to mount a robust combat search and rescue (CSAR) capability to support it. That would mean deploying other C-130s carrying helicopters that could pick up endangered commandos or retrieve downed aircraft crews. Such CSAR units would have to be deployed to nearby countries, or even land in the desert. This CSAR component complicates the operation. The Israelis could just take out the Iranian leadership. A decapitation strike iwould not end Iran's nuclear program. 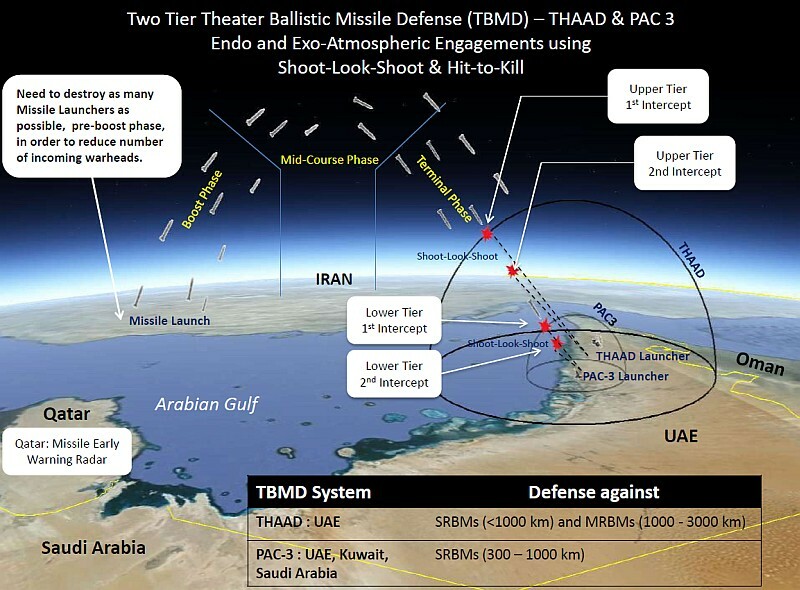 But it would almost certainly trigger an Iranian response targeting U.S. military assets in the region, as it would leave the Iranian Revolutionary Guard forces in charge of the country. It would be the one sure way for Israel to get the United States involved. A Pentagon planner: "If the Iranians harass us, we can deal with it, but if they go after one of our capital ships, then all bets are off." 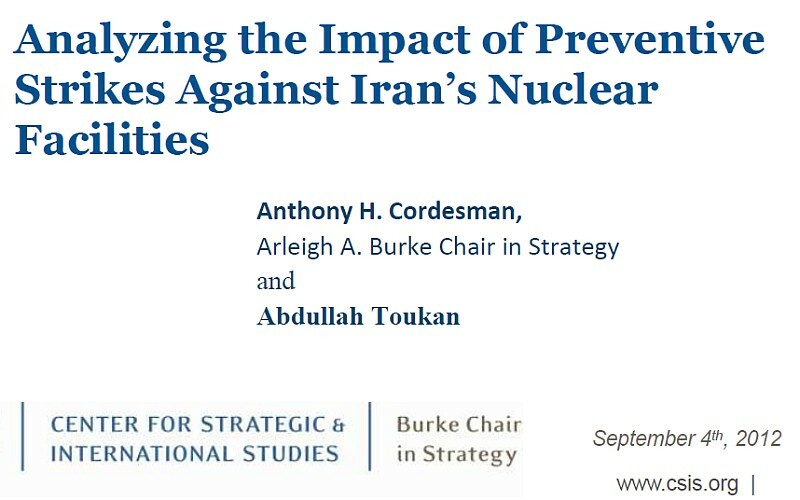 A U.S. response would not involve a full-scale, costly land war against the Tehran regime, but rather a long-term air interdiction campaign to erode Iranian military capabilities, including its nuclear program. But a decapitation campaign would deepen the rift between the Obama administration and the Netanyahu government. Retired Army officer Lt. General Robert Gard: "Our commitment to Israel has been as solid as with any ally we've ever had, and a lot of officers are proud of that. But we've done it so that they can defend themselves. Not so they can start World War III." In Centcom war game Internal Look, the United States was "pulled into" a regional conflict in the wake of an Israeli attack. The results "were particularly troubling" to Centcom commander General James Mattis. Internal Look found that Iranian retaliation against U.S. military assets could result in "hundreds of U.S. deaths," probably as the result of an Iranian missile attack on a U.S. naval vessel. The game also showed that the less warning the United States has of an Israeli attack, the greater the number of casualties taken. The United States and the international community (USIC) seek to negotiate with the Iranian regime an interim agreement that prevents further Iranian progress toward a nuclear weapon capability. Neither side ia asked to concede its current position on the core of the nuclear issue and the existing sanctions regime remain in place. Each side has an incentive to continue negotiations to reach a more permanent agreement. According to press reports, the Obama administration has already proposed something along these lines that the Iranian regime has so far flatly rejected. The USIC seeks to negotiate an interim agreement that requires greater concessions from both sides but still stops short of a final agreement. The USIC provides fuel for the Iranian medical research reactor, medical isotopes, and civilian aircraft spare parts, and commit not to impose any additional sanctions. Existing sanctions are alleviated as Iran comes into compliance with its obligations under the interim agreement. 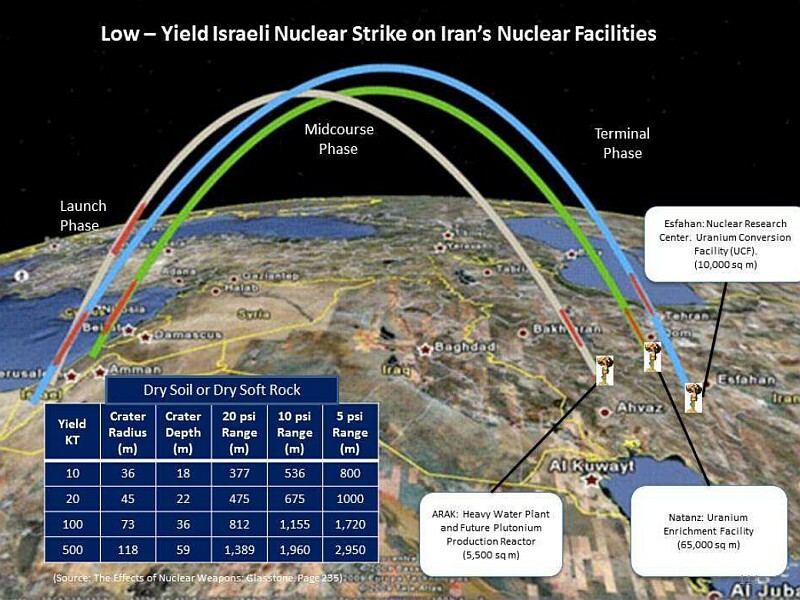 In addition to agreeing under intrusive IAEA inspection and verification procedures to cease enrichment beyond 3.5% and to cease further expansion of operations at Fordow, Iran is required to ship most of its 3.5% enriched stockpile out of the country. Enrichment at the 3.5% level can continue. If the Iranian negotiators stall on moving further, an interim agreement could hinder USIC efforts to increase the pressure. The USIC would have to commit in advance to imposing new sanctions if the final agreement deadline is missed. USIC negotiators seek an agreed final resolution of the nuclear issue in a single negotiating step. The problem is that a final agreement will take time to negotiate, and without an interim agreement in place, the Iranian regime is free to move forward with its nuclear program. A final agreement invites USIC to declare victory, unwind the sanctions, reduce the pressure, and resume normal relations with the Iranian regime. If the Iranian regime then begins eating around the edges of the agreement, it may be difficult to reestablish the existing sanctions and pressure the regime in time. Any final agreement needs to include a prior agreement on a response in the event of any substantial violation. A list of substantial violations could be included in a UN Security Council resolution. This option aims to establish a de facto status quo acceptable to the USIC based on a set of redlines. The purpose is to freeze the Iranian nuclear weapon program at its current level without rolling back the program. 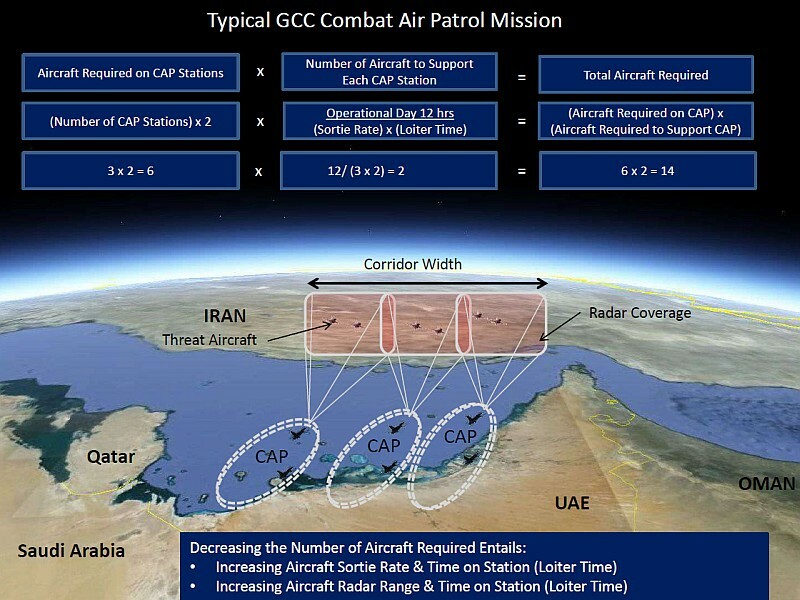 The approach gives the USIC enough time to respond to an Iranian effort to dash for the bomb. 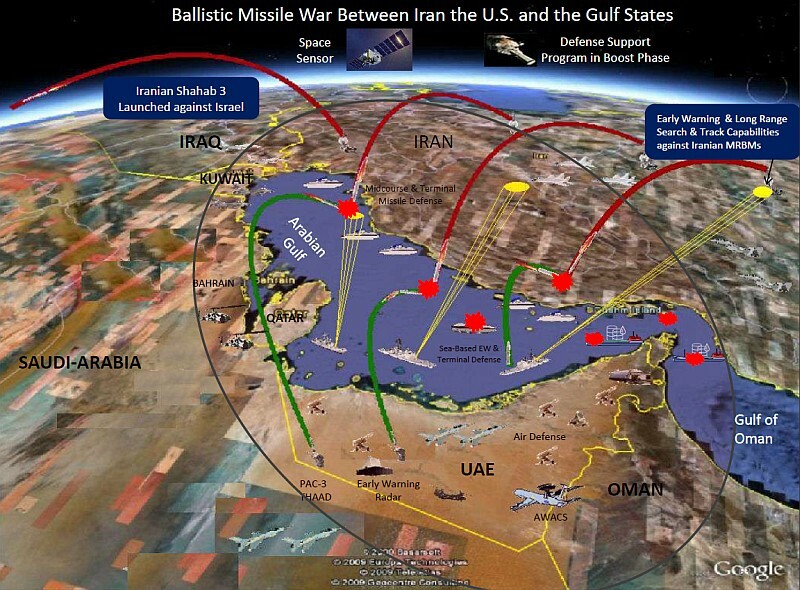 The USIC threatens action against the Iranian nuclear program if these redlines are crossed. Operationalizing this approach may require secret contacts between representatives of the UN Security Council and elements of the Iranian regime. - Without a freeze at Fordow it does not stop Iran from entering the zone of immunity. The USIC undertakes a long-term strategy of isolating and pressuring the Iranian regime. The goal is to get the Iranian regime either to abandon unilaterally its effort to obtain nuclear weapons capability or to engage in serious negotiations. This option is attractive if the USIC decides that the Iranian regime is unable or unwilling to enter into a negotiated settlement or if negotiations break down. It could be an alternative or a follow-up to military action. These measures may cause debate and division within the Iranian regime. The United States could use the prospect of a military strike to enhance the effectiveness of its diplomacy. A limited military strike will need to be well prepared diplomatically and operationally and must be followed by increased pressure on Iran. If efforts to resolve the confrontation over the nuclear issue fail, and the USIC either decide to forego the military option or find that it does not achieve their desired objectives, they could elect simply to accept an Iranian regime with a clear path to a nuclear weapon, and even with a nuclear weapon itself. This course of action would reflect a judgment that an Iran with nuclear weapons could be deterred or contained. AR This is all rather worrying.